ALROSA DUMPS DIAMONDS ON GOKHRAN — IT’S CHILD’S PLAY SO FAR, BUT WHAT HAPPENS NEXT? Alrosa appears to be selling all of its rough diamond production this year to the state stockpile agency, Gokhran, exceeding earlier estimates of the state budget funds previously allocated to sustain the state-owned company’s mining operations. 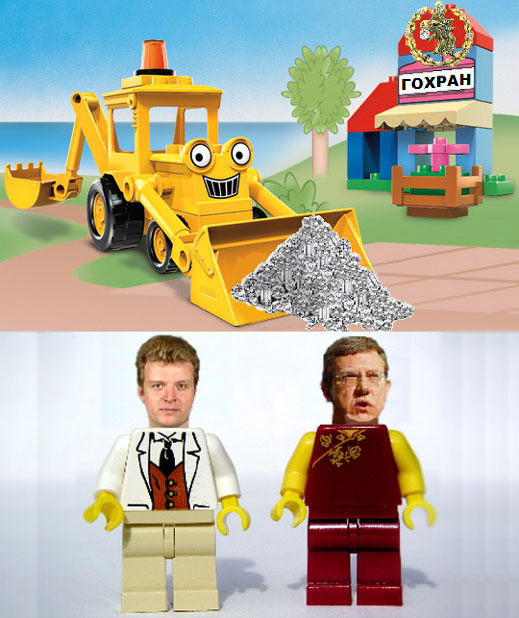 Both Alrosa and Gokhran are under the control of Russia’s Finance Minister, Alexei Kudrin (pictured right). According to a report by Interfax, in September Alrosa has sold Gokhran rough worth an estimated Rb20.4 billion ($669 million). For the 9-month period just ending, Interfax reports that Alrosa has sold a total of Rb32.5 billion ($1.1 billion) worth of diamonds to the state repository. Alrosa’s chief executive, Fyodor Andreyev (pictured left), and his spokesman, Alexei Polyakov, were unavailable to confirm the numbers, but a Gokhran source has confirmed their accuracy. Alrosa is not clarifying either its production target for the year, or its sales target. Gokhran is also buying polished diamonds from the state-owned enterprise Kristall of Smolensk. Kristall declined to say what value of diamonds it has delivered, or plans to deliver to the state stockpile this year. At peak in 2007, Kristall produced $404 million worth of polished stones which were sold mostly outside Russia. This year, output may slide to less than $100 million. A report by the Fitch ratings agency in June estimated the value of state financial support for Alrosa this year would amount to Rb45 billion ($1.5 billion) in procurement of rough for Gokhran in the first half of the year; and Rb44 billion in financing from the state VTB Bank for covering some of Alrosa’s maturing obligations to foreign lenders. Fitch also forecast that it “expects that the company’s FY09 sales will be 20%-25% below that of FY08, including volume off-take by the Russian State.” Successive sessions of the Alrosa Supervisory board this year have produced differing mine production targets. But since these have been expressed in dollar value terms, without disclosing the carat volumes or the rough diamond price used for the valuation, it is impossible to say from these data whether Alrosa is holding to last year’s mine output level, or cutting back. Alrosa’s annual report for 2008 reports that diamond sales in 2008 amounted to $2.3 billion, while the value of production was reported as $1.8 billion. Ararat Evoyan, the director of the Russian Association of Diamond Manufacturers, told Polished Prices he is skeptical of the latest leak. “Alrosa cannot be selling all of its diamonds to Gokhran, because the value of the total amount of diamond production [this year] is over $2 billion, while Gokhran has already spent $1 billion.” Evoyan says he believes that Alrosa is exporting “quite a big volume of diamonds as well”. Gokhran declined to respond to a request for details. Following his takeover of the leadership of Alrosa in July, Andreyev has made few public statements, and none in an open forum. He is reported as saying this week in Moscow that by the end of next year he aims to reduce the total debt of the company to $3.2 billion. This suggests that Alrosa’s debt is currently greater than has been disclosed before. In May the Fitch report said that “Alrosa’s debt measured in USD has increased in the last three years by 2x from USD1.5bn to USD3.3bn.” According to the Alrosa report for 2008, the aggregate of short-term and long-term debt as of December 31 last was Rb105 billion (now equivalent to $3.5 billion). Another company statement, released on the website on August 18, claims the net debt at the close of 2008 was Rb115.6 billion (now equivalent to $3.9 billion). In the latest statement reported from Andreyev, the debt is Rb155 billion ($5.2 billion).